Comfortable. Convenient. Connected. Classic. The Dodge Grand Caravan has been a staple of American families since 1983, and it remains a leader in the very segment it created. The 2018 Dodge Grand Caravan is smart, versatile, efficient, safe, and surprisingly affordable. Even with all the bells and whistles, it’s the most affordable minivan on the market. The 2018 Dodge Grand Caravan is the obvious choice for any family on a budget. 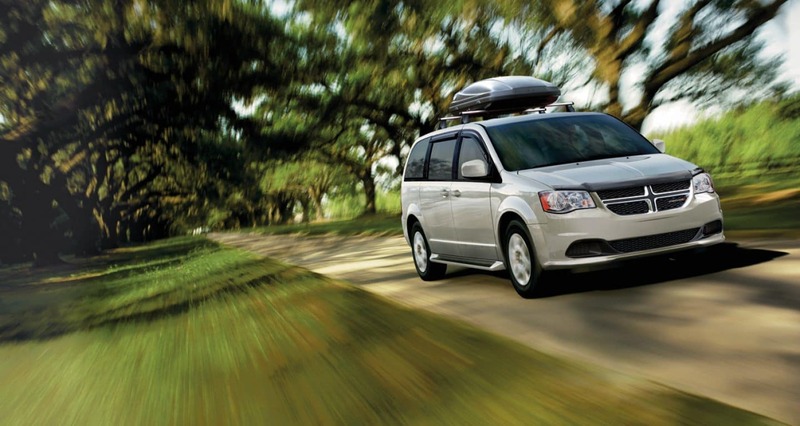 Landers Chrysler Dodge Jeep Ram in Norman, Oklahoma offers the Grand Caravan in a variety of styles. Our customers come in from across the Oklahoma City metro, including Edmond, Moore, Midwest City, Yukon and Del City. The interior of the 2018 Dodge Grand Caravan is all about comfort. The seats are made with premium cloth and leather materials, along with soft-touch armrests and door panels. Available power front seats allow you to move up, back, tilt and recline. They also include a two-way power lumbar adjustment so you can get the support you need where you need it. The van seats 7 people, which makes the automatic temperature control a very beneficial feature to have. Automatic temp control allows the driver, front passenger and rear passengers to each set their ideal comfort levels. That way, everyone can ride happy! The 2018 Dodge Grand Caravan is the perfect vehicle for long family road trips, sitting in carpool lines or just letting yourself rest a little during a busy day of wrangling kiddos. Convenience is abundant in the 2018 Dodge Grand Caravan. The wagon is full of clever storage solutions that you can find everywhere from the front to the back to under your feet to over your head. It also offers a number of innovative touches. For your hauling needs, the van offers storage behind the third row of seating, available overhead bin, front seat storage for day-to-day essentials and in-floor bins for when you need to carry the kids and the cargo. When you don’t need all 7 seats, you can fold the two back rows into the floor with Stow ‘N Go storage, giving you more than 140 cubic feet of free space. You can block out harmful UV rays and reduce AC usage with available sun shades, which is an enticing bonus if you have kids to haul around. Keep an eye on the kids with the observation mirror that lets you see the back two rows. Adjustable LED reading lamps are available above all three rows, which can be individually adjusted for precision lighting. The fully integrated super console contains four illuminated cup holders, two power outlets and covered storage solutions so you can keep your valuables out of sight. The 2018 Dodge Grand Caravan makes it easy to integrate your technology. You can hook up all your devices to the mounted touch-screen infotainment system available in both the front and the back. You can access a backup camera, GPS navigation, and SiriusXM satellite radio with more than 130 channels. The single DVD entertainment system available for the back comes with wireless headphones, so your kids don’t have to listen to your grown-up stuff and you don’t have to endure that cartoon musical for the thousandth time. You can connect virtually any music player or smartphone up front, and most gaming systems for your passengers, too. With Uconnect voice command, you can operate your phone, radio and navigation system hands-free. Family owned and operated, Landers Chrysler Dodge Jeep Ram of Norman is the perfect place to get a 2018 Dodge Grand Caravan for your family. Put your family first. Stop in today or take a look at our online inventory! Browse our 2018 Dodge Grand Caravan inventory online.